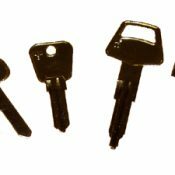 A key for Sunbeam cars manufactured between 1948 and 1973 cut to number or photo. Models Include: 80, 90, Alpine, Harrington, Tiger, Rapier, Imp Sport, Stiletto. We do not use original blanks, we use high quality steel blanks manufactured by Silca.